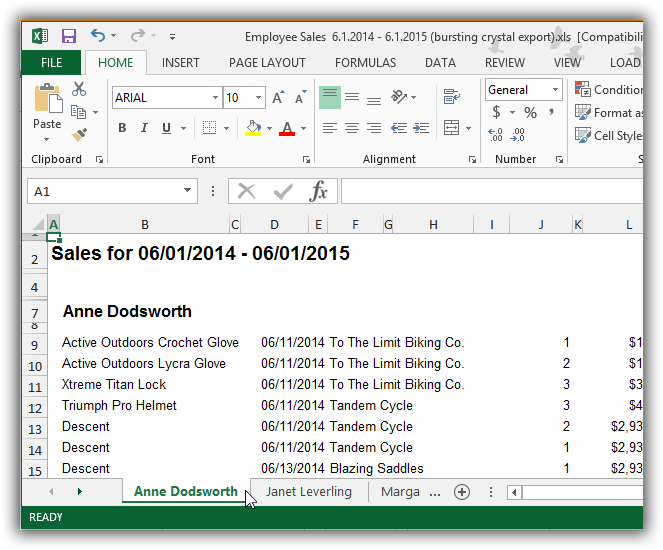 Run multiple reports, export and merge them in one Excel file. Each report will be placed into a separate worksheet. These methods work for both local and SAP BOE Crystal reports. This video shows an example for R-Tag exporting multiple reports to a single Excel file with multiple worksheets (tabs). Each report will be exported to a separate worksheet. Create a job, add your reports and create an output on job level. Job level output will export all reports in the job to a single file. 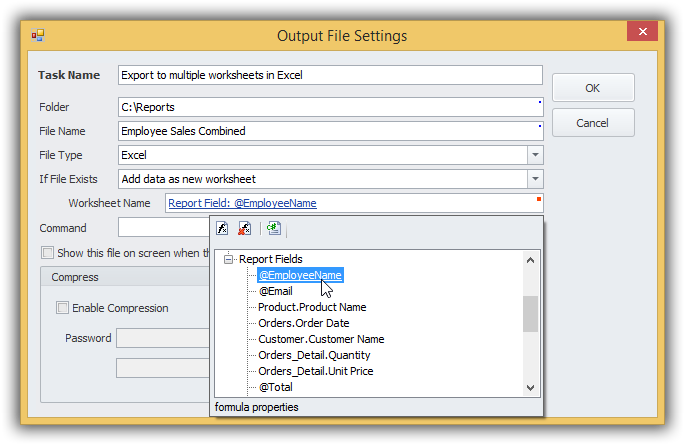 When exporting to Excel each report will be placed in a separate worksheet. Export to PDF will generate a single PDF file with bookmarks for each report. When creating a new export task select Excel as file type and set "If File Exists" option to "Add data as a new worksheet". That's it! When R-Tag exports the report if there is no file it will be created. If file already exists the report will be added as a new worksheet (tab). The screenshot above is from the bursting example provided with R-Tag. It is using a value returned by the report formula @EmployeeName as a name for the new tab. 2. Export to Excel using advanced R-Tag export. Here is a sample of the same report exported using R-Tag advanced export for Crystal reports. The data is exported as an Excel table with frozen columns, filter and totals, which will be recalculated when a filter is applied. All standard Excel table styles are supported.